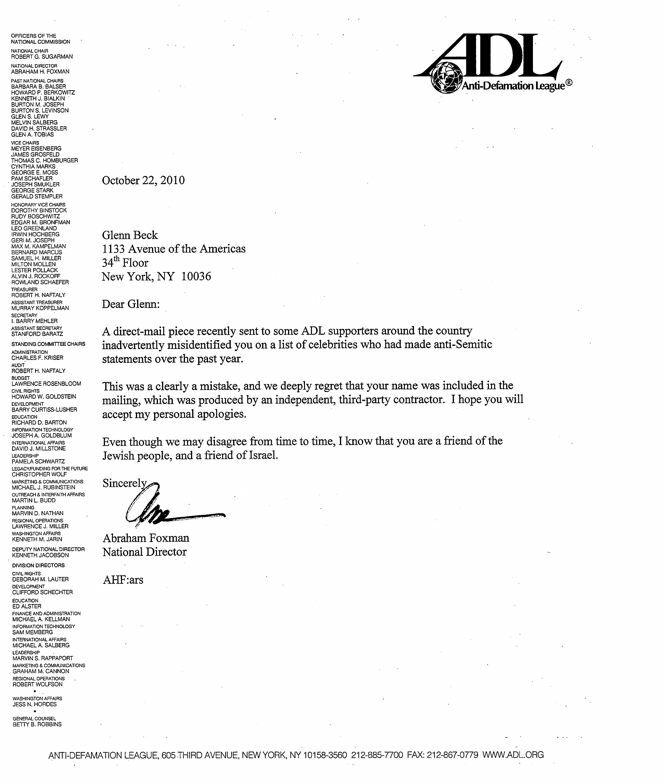 In wake of controversy, ADL's Abe Foxman says that Beck is good on Israel but sometimes makes "insensitive remarks"
The Anti-Defamation League's Abe Foxman said in a statement sent to Salon today that he still believes Fox host Glenn Beck "is a strong supporter of Israel and the Jewish people," even in the wake of a week of conspiratorial attacks on George Soros that some saw as anti-Semitic. "But I also believe that there are certain things he doesn't understand, which have led him to make insensitive remarks," Foxman continued. Foxman had criticized Beck this week on fairly narrow grounds -- that the Fox host went too far when he (falsely) accused Soros, who as a boy survived the Holocaust by posing as a Christian, of helping send Jews to the death camps. Beck also called Soros a "puppet master" who, he claimed, was personally responsible for many of the catastrophes of the 20th century and who is now setting his sights on America. Salon asked the ADL if Foxman still felt that way in the wake of the Soros documentary. In response Foxman offered the affirmation quoted above. The dynamic here is a tension between the ADL's dual identities as a civil rights organization and a pro-Israel advocacy organization. This same dynamic was at play earlier this week when Foxman came to Soros' defense but was careful to note that the ADL often disagrees with Soros, who is not a Zionist. I think the most popular is going to be - if I had to guess, their attack is going to be that I'm anti-Semite, which does not even make any sense. First of all, no one is a bigger defender of Jews and Israel than me. Name them on television. I'll tell you what - George, you and I will walk down the streets of Israel together. Let's go to Jerusalem - you and me. Let's see which one of us is more popular. It doesn't make sense. The basic argument is that support for Israel and anti-Semitism are mutually exclusive.